Outstanding addition to the Guild Hunter Series!! What I liked: I really want to gush but I'll try to hold it down a bit. Archangel's Enigma is nothing less than I expected from Ms Singh. I started reading it on release day evening and of course couldn't find a spot to stop but I didn't want to rush things and read important details while I was half asleep. I finished the next evening after extending my bedtime by over an hour. (Yes, I have a routine but Ms Singh is one of the few authors who will make me break it). After being so impressed by the previous book, Archangel's Shadows, I was a little worried about how Naasir was going to fare in his own book. I was hoping for more of his background and Ms Singh delivered up to a point. I guess I just find it very hard, even with my imagination to actually picture him. I'm still not sure exactly what Naasir is so I will stick to what Elena calls him, a tiger-like creature. Naasir's character is so very honest, fun-loving, and in some ways childlike. His back story explains mostly why his actions and reactions are what they are. 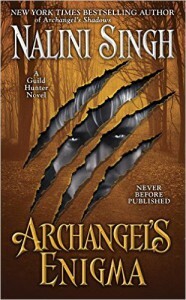 He's seen his "family" find their mates and in Archangel's Enigma, Naasir is on a quest to find his but his Archangel, Raphael, needs him to find an Ancient before the evil Archangel (Zhou) Lijuan) can kill the Ancient while he sleeps. Enter Andromeda, a scholar who might have the clues needed to save the Ancient. Andi (as Naasir calls her), is in danger and keeping secrets from just about everyone. She is fascinated by Naasir, who wouldn't be, and he's making her feel things her vow of chastity can barely overcome. To Naasir, Andi smells like mate and he's impatient to claim her but he believes vows are sacred even if Andi is willing to break hers. "Stupid Grimoire book"
Archangel's Enigma is Naasir and Andi's story but so much more. Just about every character makes an appearance to help further the plot line of the story and believe me, it's a doozy! So much information about each character is explained and the story just keeps moving forward. What I didn't like: I have no idea what to write here. I enjoyed each and every character, each morsel Ms Singh reveals and the chemistry between not only Naasir and Andi but the central group surrounding and including Raphael and Elena. This series has gripped and held me from the very beginning. It's one of the first recommendations I make to friends and others wanting something spectacular and unusual to read. I re-read some books in this series so many times that I had to re-buy them for my e-reader.